We’ve mentioned in earlier posts that there’s a heated battle going on between genuine ink cartridge manufacturers and third party ink cartridge manufacturers. The Original Equipment Manufacturers (OEMs) rely on profits from their cartridges particularly because they sell their printers at a loss. However, this OEM strategy has resulted in there being a huge difference in OEM ink cartridges and third party ink cartridges. Since people started buying compatible ink cartridges to save money, OEM tried to counter by introducing technology aimed at preventing compatible ink cartridges from being used in their printers. While this technology temporarily managed to block of compatible ink cartridges, it has become so refined that now there are instances of genuine ink cartridges being blocked off too. There’s no news on how the OEMs are planning to remedy the problem but it does leave the user in a fix. Take Epson inkjet printers for example. It’s likely that you’ve either faced the problem of Epson ink cartridges not being accepted by the printer or heard about someone who faced this problem. 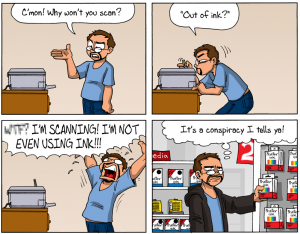 This isn’t even a problem limited to Epson compatible ink cartridges. There’ve been similar complaints from genuine Epson ink cartridge users as well. So, what can you do when such a problem arises? There are various things you can try to make those pesky Epson compatible ink cartridges behave. Consider the following. If you’re facing the cartridge not recognised error, then you’re either replacing the full set of cartridges or only a single one. One of the tricks of doing away with the cartridge not recognised error is to try both the methods. Consider. If you’ve been trying to install only one Epson compatible ink cartridge, then try turning off the printer, removing all the cartridges and installing all of them before turning the printer on. Turning off the printer works because it wipes out the printer’s memory so that it sees all the cartridges as fresh and new. If you’ve been trying to install a new set of cartridges, then you may want to consider staggering the installation. This means rebooting the printer once and then installing the Epson compatible ink cartridges one by one so that the printer records the cartridges separately. If there’s a problem with one Epson compatible ink cartridge, then this technique will also reveal it to you. More often than not, Epson compatible ink cartridge related errors are caused by the cartridge not being installed properly. This doesn’t mean that there’s something wrong with the software side of things. It just means that the Epson compatible ink cartridge didn’t click as well as it should have. So, the simple solution here is to remove the Epson compatible ink cartridge and try installing it again. If neither the first nor the second solution works, then you can try to check the chip on the Epson compatible ink cartridge. OEMs introduced the concept of chips on their cartridges for two reasons. The first was to help the printer monitor the status of the cartridge and the ink inside it while the other was to make it more difficult for third party manufacturers to make compatible ink cartridges. The same is true in the case of Epson. So, if you’re getting a cartridge not recognised error, then it’s possible that there’s something wrong with the chip on the Epson compatible ink cartridge. For instance, if the surface of the chip isn’t clean, then the contact wouldn’t be complete which would make the printer unable to recognise the cartridge. Resultantly, if you take the offending Epson compatible ink cartridge out and clean the chip on top of it, then it may resolve the problem for you. Make sure that you do it gently and with lint free tissue or cloth or you may worsen the problem rather than solving it. The contact wire of the printer is the printer counterpart of the chip on top of the Epson compatible ink cartridge. Just like the chip on the cartridge, dirty contact wires can also be the culprit. In fact, these contact wires are actually much more sensitive and delicate than the chip on the cartridge. Effectively, the first thing you need to do is to check if they’re in place or if they’ve been pulled out due to some reason. If they’ve been pulled out, then you can try to put them back in place but this rarely works. If it’s impossible to put them back, then your only recourse is to get your printer services. However, if they’re in place, then you should try to clean them just like you cleaned the chip on top of your Epson compatible ink cartridge. What if your printer doesn’t give you any ‘cartridge not recognised’ error and your Epson compatible ink cartridge fits perfectly but the print quality is not right? Is this even the fault of your cartridge or is something wrong with your printer entirely. What can you do? The first order of the day is to not worry. This usually happens when the print head isn’t clean. For instance, this is common with users whose cartridges needed replacing but they delayed a few days. What waiting does is that it allows the ink already in the print head to coagulate since there is no fresh flow of ink. The solution to this problem is fairly simple too. You need to use the inbuilt print head cleaning feature. If that doesn’t work, then try other print head cleaning techniques. Sometimes all your Epson compatible ink cartridges will be installed fine but your printer will start giving you the frustrating low ink warning. This is not a cause for alarm because the low ink warning system of printers is inherently rigged. For example, printers are designed to give low ink warnings even when there is ink in the cartridge simply because an empty cartridge can damaged the printer head. While the reasoning is sound, the implementation isn’t because the low ink warnings are sometimes triggered even when the cartridge has 50 percent of its ink left! Because of this inherent flaw, it’s not uncommon for Epson compatible ink cartridges to cause low ink warning in the printers. You don’t need to worry. Consciously ignore the warning and continue printing like it wasn’t there. 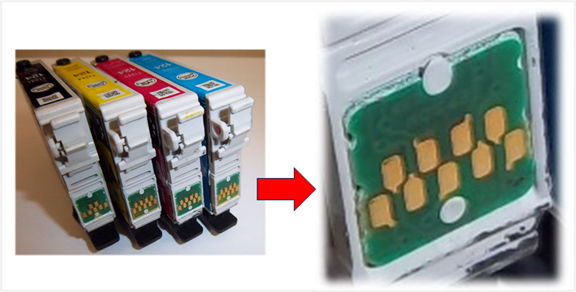 Some customers try to combine Epson genuine ink cartridges with Epson compatible ink cartridges. This combination doesn’t work. Firstly, if you attempt this, your printer will most probably refuse to recognise either the Epson compatible ink cartridge or the Epson genuine ink cartridge. Further, even if your printer does recognise the two different types of cartridges, you’ll note that your print quality has suffered. Why does this happen? It happens because the composition of the ink inside the Epson genuine ink cartridge is different from the composition of the ink inside the Epson compatible ink cartridge. When two ink mixtures combine together, they don’t produce the type of colour and consistency that they’re supposed to produce. As a result, your final print quality suffers. Epson printers are outstanding for its easy to understand innovation and quality print. Thanks for your support and sharing this informative article. I disagree with you. I have had nothing but problems with Epson printers. I have had it less than a year and it doesn’t work right. My WF-7610 lasted just over a year. Now it doesn’t print black. I tried cleaning cycles, changing to genuine Epson cartridges. Nothing works. It was great as long as it worked. I had exactly the same problem but thankfull mine was still under warranty. I got a refund and bought the 7710. I’m hoping that the problem has been fixed in this newer model but we’ll see!! obviously this comment is from an Epson employee. Fail – Totally useless. This EPSON WF-4630 printer will not accept the compatible cartridges no matter what we try! Did you buy those compatible cartridges from IJW? If you did, have you tried contacting our support? I’m sure they can fix the problem one way or another. I have an Epson XP-412 and use Jet Tec compatible cartridges, they are as good or better than Epson originals, but I keep getting the usual messages from Epson on my printer every time I change a cartridge, which is a pain, because it makes a simple exchange a prolonged task instead of an easy replacement, after pressing several buttons I eventually manage to get the cartridges accepted. Because of this I am looking at other Printers when it becomes time to replace my Epson. Have you tried all varieties of compatible cartridges? I’m sure there are options there that still work. Try our main website. Our cartridges are tested and if they still give you trouble, you can return them. Ditto! Same update, same date, now Epson printer will recognize EMPTY Epson cartridge and say everything is fine, but it’s no go with a cartridge that worked two hours before the update. is what epson are doing legal? Ford don’t insist I use a certain oil in my car. I’m afraid I can’t answer your question with such limited information. I would suggest that you contact our support team. Trust me, those guys are special when it comes to printers. Here’s the link. You can make Your printer chipless – that means it will never require ink cartridges – IC Chips on cartridges – You can use cartridges without chips – printer will show always 100% ink level full. It is the best solution for Epson printers. how the heck do you do this! ?